AR: Yale Students Boycott Commencement Speech by Nigerian Ex-President, Goodluck Jonathan; Complain of "Cultural Appropriation"
Yale Students Boycott Commencement Speech by Nigerian Ex-President, Goodluck Jonathan; Complain of "Cultural Appropriation"
A recent decision by administrators at Yale University to invite the former President of Nigeria, Mr. Goodluck Jonathan, to deliver next year's commencement speech has been met with wide condemnation by the student body. The decision to invite Mr. Jonathan was made in early October, but was announced roughly coinciding with the surge in student protests following a controversial e-mail sent to the student body by the wife of the master of Silliman College, Ms. Christakis. In that e-mail, Ms. Christakis disavowed an earlier e-mail sent by a cultural committee which dissuaded Yale students from donning potentially offensive Halloween costumes, and from wearing "turbans, feathered headdresses" and other traditional pieces which could constitute cultural appropriation. Ms. Christakis argued that the university was going too far in telling adult students what they could or could not wear. 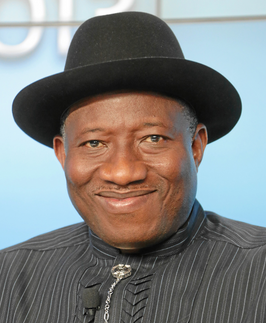 Former President Jonathan, who received a cowboy hat as a gift from George W. Bush during one of his visits to Africa, is known for proudly sporting the gift given to him by the former Texan chief of state. This has caused consternation among some of the Texan students at Yale, who rallied outside of the university president's house, with signs reading: "My culture is not a political prop"; "Cultural Appropriation is not OK"; "I'm a cowboy, not a dress toy." Jessica Houston, a member of the social advocacy group "Texan Students at Yale," decried what she called the use of "cowface" by former President Jonathan. Houston told Abreu Report: "The University should be a platform for tolerance, not hate and cultural appropriation. We can't have someone on campus using the cultural pieces of marginalized groups for their own political gain." Defending former President Jonathan in an article in the Nigerian Herald, a supporter wrote: "Even when Jesus healed the sick or resurrected the dead, they found fault with him. What many of us now revere as Holy scripture, that is Goodluck Jonathan’s reality. Damned if he does and damned if he doesn’t." Given the tense climate on campus, Yale University may be forced to rescind the commencement speech invitation to Mr. Jonathan. Some students see this as a loss for free speech, but most see it as a victory for tolerance and social justice.